It's inspired by the CLX and offers many of the same features as Martin Logan's flagship. 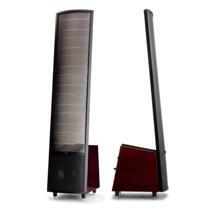 The Montis - no, not Mantis - is the latest speaker to come out of MartinLogan. If you've seen one MartinLogan speaker then you're familiar with the look and general principle behind the Montis, but the company's new electrostatic speaker is more than just nice. The Montis offers the same controlled dispersion XStat technology and DSP engine that you'll find in the higher-end speaker, all of which combine to provide mid-range clarity and excellent performance on the lows. It also utilizes an electrostatic transducer that, thanks to several new technologies, has a radiating area twice that of older speakers. Though the Montis is more than just a pretty face, it sure does succeed at being absolutely gorgeous. You can pick it up in a variety of wood finishes including a new Gloss Black Cherrywood. You can pick up a pair yourself later this month for $9,999.